FR3070A is a high-performance In-System Programming board designed to be mounted on Agilent Medalist In-Circuit Board Test System Utility Card. This programmer comes with the necessary software and drivers that can be integrated into the Agilent Medalist Window XP environment, to improve the user experience in developing and debugging production tests. Up to three FR3070A can be fitted in the Utility Card. FR3070A shares the same programming engine of the FlashRunner Series. It currently supports over 7.500 microcontrollers and serial memories from the most popular Silicon Manufacturers (Atmel, ON, Cypress, Freescale, Fujitsu, Infineon, Winbond, Microchip, NEC, NXP, Renesas, Silicon Labs, SST, STMicroelectronics, Macronix, Texas Instruments) and, thanks to its flexible architecture, it is ready to support other architectures. • USB 2.0 and Ethernet connections. • Firmware and programming algorithms are fully upgradable via software. FR3070A is composed of a main board (which plugs into the Agilent Utility Card) and of the actual programming engine. The programming engine is contained in a SIMM module placed on the bottom of the main board, in order to save vertical space. 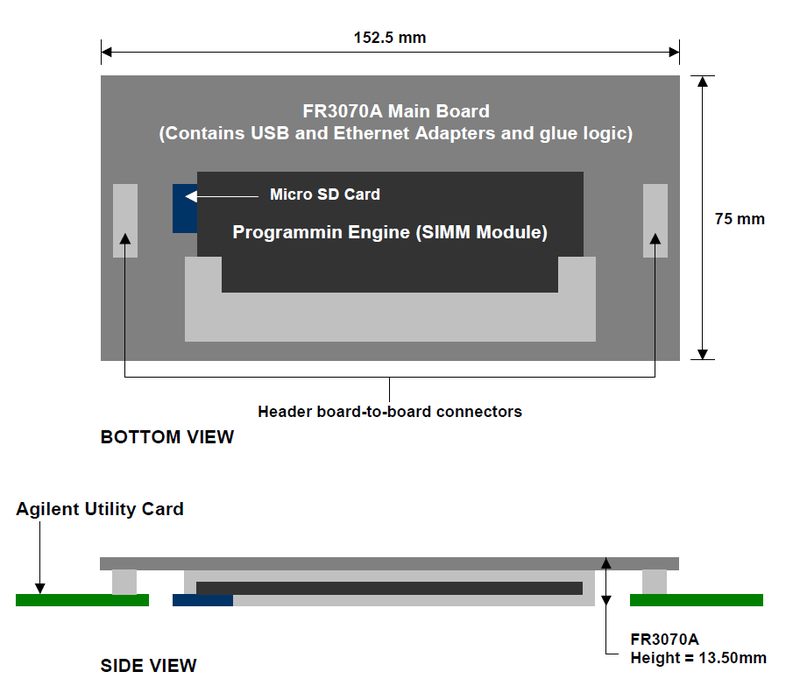 The figure below illustrates the bottom and side views of FR3070A. FlashRunner allows you to personalize each board by storing user information in the target device. Information such as Serial Number, MAC Address, production batch, firmware version, remote control frequencies and, in general, all kind of data that differs from board to board, can be easily incorporated in the board. This data can be taken directly from the product or board barcode, for example, for a full automated process.